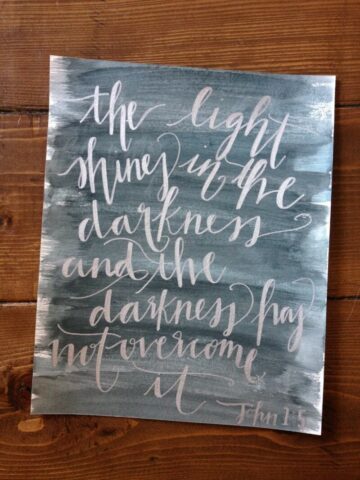 I’m so thrilled to be sharing Jesus, Light of the World: Praying the Scriptures through Advent with you. In celebration of the release of my first ebook, I have a give away for one of you! Yippee!! I also have several more “Praying the Scriptures” resources in store for you!! 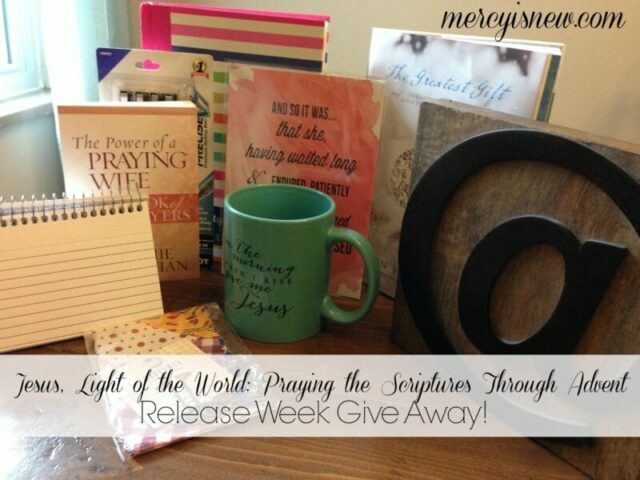 If you purchase Jesus, Light of the World: Praying the Scriptures through Advent between now and MONDAY at midnight, you will be entered into a GIVE AWAY for these awesome prizes!! ONE blessed reader will receive this package of goodies from me! U.S. residents only. Some of my very favorite items for prayer & journaling…and a few other fun things as well! A journal, index card spiral, my favorite pens, favorite coffee mug, Ann Voskamp’s Advent book, Praying Wife prayer book, Dayspring Redeemed necklace, Dayspring Letterpress block, 2 beautiful prints. You will also receive this lovely print created by my local friend, Mary Kate. It didn’t make it into the picture above, but it will come in your package as well! One of my favorite passages from the Advent resource! Purchase Jesus, Light of the World from my shop!